Saturday evening, by eight o’clock in the evening, January 22nd 1842, a devastating fire started in Trondheim. 371 apartment buildings burnt down and 3000 people bacame homeless. This was the second big fire in the city in only nine months. The wood house city of Trondheim was drabbed by five city fires during the 1840’s. The city authorities had several times evaluated a direction for brick buildings only, and this direction was finally initiated in 1846. One had earlier argued against brick buildings, because one had claimed the climate in Trondheim to be unfavourable for building materials like brick and stone! The rebuilding after the fire in 1842 advanced quickly, but was sharply critized. 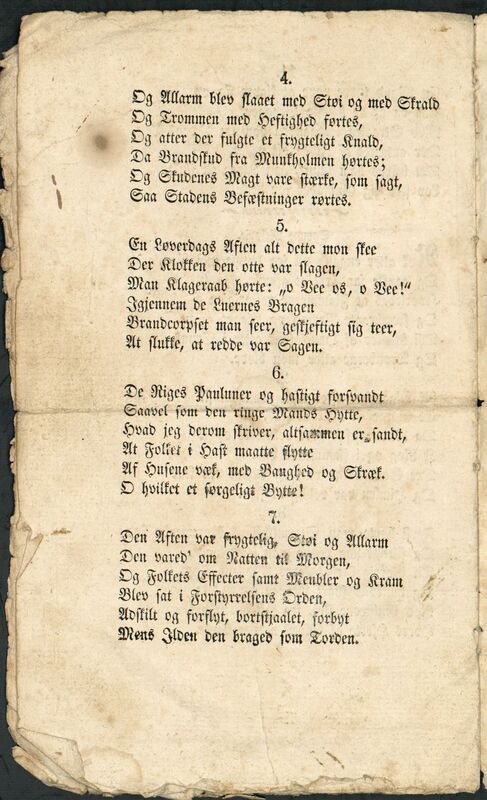 In the journal «Granskeren», published March 2nd 1843, an anonymous journalist is blaming the city authorities for not being innovating and for not taking sufficient steps to increase fire safety nor estethic considerations. The earlier narrow alleys was just rebuilt, which this writer finds criticizable as he claims that the state has payed eight barrels of gold to cover the costs of rebuilding Trondheim after the fires in 1841 and 1842. The city authorities in Trondheim was said to rebuild according to the old plans of Johan Caspar De Cicignon, dated from 1681. The Gunnerus Library owns a regulation map showing the Sanden area (Sandgata) and Dronningens gate with crosswise streets and alleys. The red lines indicates the old buildings, and it is possible to observe that several streets and alleys are going to be considerably broader. Search for “map” and “1842” at www.gunnerus.no, and try to zoom in on the map! The acute need for new buildings after these fires attracted architects and many different craftsmen to the city; Norwegians and foreigners. They advertised their services in the local paper Adresseavisen. These new craftsmen advertised for apprentices as well. There was a period of growth; work and money for more people, and working people, the city’s own craftsmen and innkeepers experienced good times. After some time, increased prizes on building materials and manpower made the development go in an opposite direction. Some built their new houses too big and too expensive, and several businesses experienced bankruptcy. But still the fires meant just a brief stagnation; the Trondheim businesses rised over again. The artist C.M. 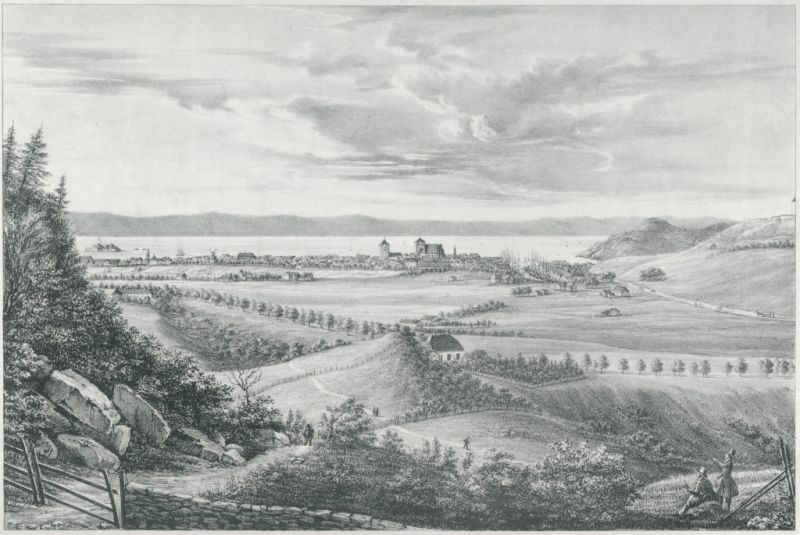 Tegner made this beautiful drawing of Trondheim and it’s surroundings in 1842, the year of the big fire. This drawing is also available at www.gunnerus.no ; where you can zoom in on the picture. C.M. 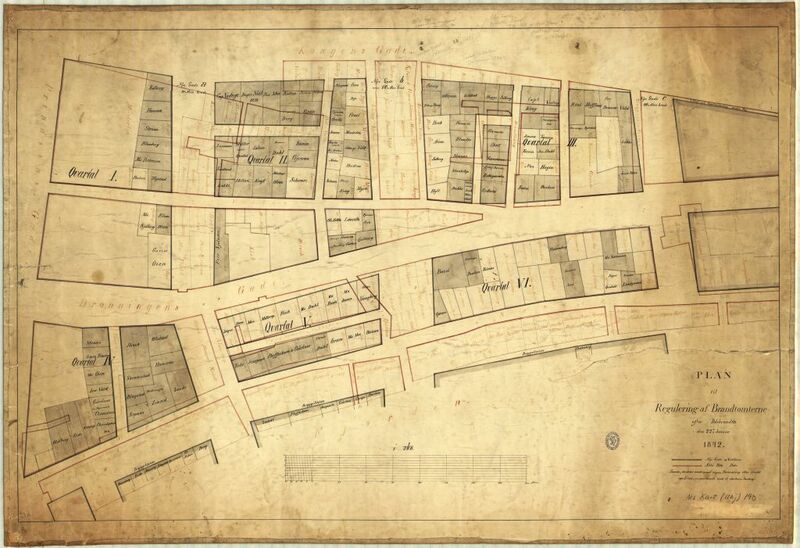 Tegner made a key map for the city regulations after the fires of 1841 and 1842 as well. This map is owned by The Regional State Archives in Trondheim. Ingrid Pedersen. 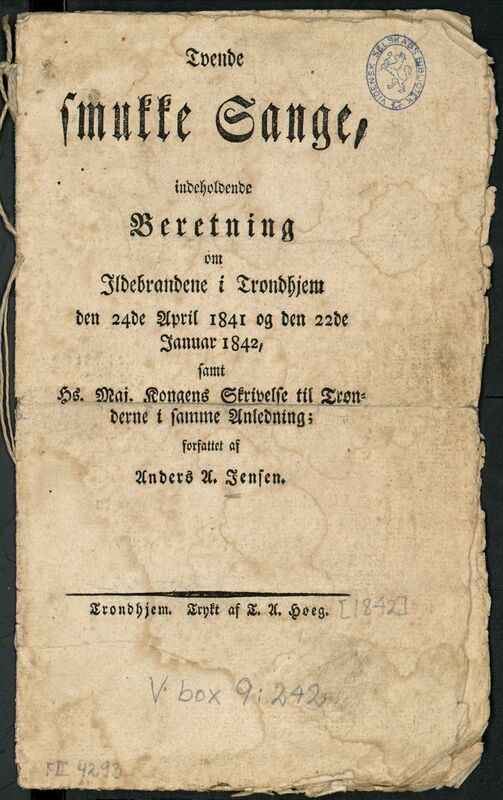 Et lite kapitel av Trondhjems Bygningshistorie: brandene i Trondhjem april 1841 og januar 1842 og gjenopbyggingen av de brente strøk efter de nye planer. Særtrykk av Trønderske Blade, 18. og 25. mai 1935. Trondhjems Regulering. I: Granskeren, 02.03.1843. Anders Kirkhusmo og Per R. Christiansen, red. Trondheim brenner: branner og brannvern i byen gjennom 1000 år, Trondheim 2013. I am a senior librarian at the NTNU Gunnerus Library. I work with literature services to students and NTNU employees, as well as conveying and marketing the library's collections. About the Author: I am a senior librarian at the NTNU Gunnerus Library. I work with literature services to students and NTNU employees, as well as conveying and marketing the library's collections. More from this author.